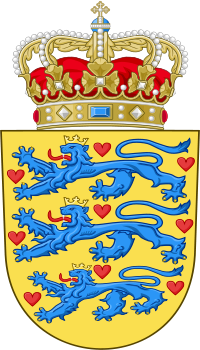 Coat of Arms: The National Coat of Arms features three crowned lions facing left, surrounded by nine red hearts, all placed atop a golden shield. The crown on the shield is the crown of King Christian V.
The current version was adopted in 1819 during the reign of King Frederick VI. Motto: "Guds hjaelp, Folkets kaerlighed, Danmarks styrke." "God's Help, the People's Love, Denmark's Strength." National Anthem "Der er et yndigt land" (I know a lovely land), melody by Hans Ernst Kroyer, and lyrics by Adam Oehlenschlager. In addition, "Kong Kristian" (King Christian stood by tow'ring mast) is also a national anthem, but it is considered the anthem of the Danish royal family. Dating to the early 1800's, it features lyrics by Johannes Ewald, and melody by D.F.R. Kulau.